e-Commerce platforms are like smartphones – they constantly add better features, implement new looks, higher performance speed and tempting pricing policies. 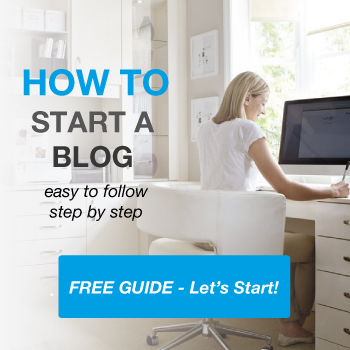 Therefore, no matter how satisfied you are with your current cart – there will surely occur a new solution, within a month or so, that will tempt you to switch. And that’s a good thing – that nobel concept of staying faithful is counter-productive in on-line business. As a store runner, you don’t ever want to miss great new e-Commerce features after they’re released. Otherwise, you’ll lose the market battle to your more advanced competitors. That’s why re-platforming – migrating from one shopping cart to another – is such a popular procedure nowadays. Cart2Cart was launched in 2009 by MagneticOne – an e-Commerce specialized company with offices in San-Diego and headquarters in Ternopil, Ukraine. 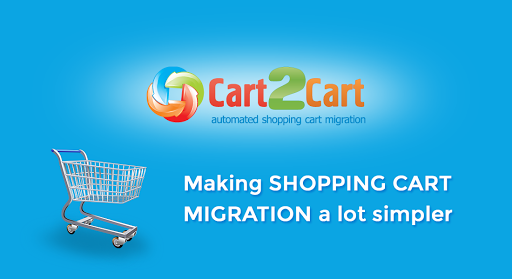 Cart2Cart is an automated shopping cart migration service that can boast of the largest number of supported platforms – 70. 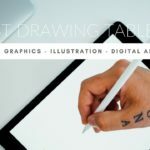 It’s broad list of partners includes shopping cart vendors like PrestaShop, CS-Cart, X-Cart and prominent hosting providers like InMotion Hosting. Over the course of its existence Cart2Cart has completed over 30 000 of successful migrations – from one cart to another, or to a newer version within the same platform. The minimal fee is $69 – if your store is small, it’ll probably cover it. However, the transfer of a big number of items will cost you more. There is a price estimator on their website that allows to enter the amount of products, customers and orders and calculate the expenses. Note, however, that it doesn’t include the price of additional options, if you decide to order some, and migration insurance. Migrations of data, especially from substantial, old stores, are associated with anxiety for a lot of e-merchants. That’s understandable – plenty is at stake. 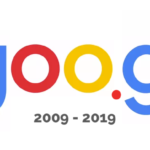 Store items, customers’ records, SEO ranking – it’s a worst nightmare to lose any of those. So, it is reassuring to know that there is always someone behind during such major procedure as re-platforming. Cart2Cart people realise that, and provide a reliable support via chat, phone or email for free. 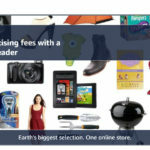 This page is for providing details about both your shopping platforms. For hosted carts (like Bigcommerce) – it’s enough to paste store’s URL and API details. 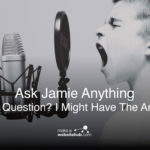 For self-hosted ones (like Magento), however, things are trickier. 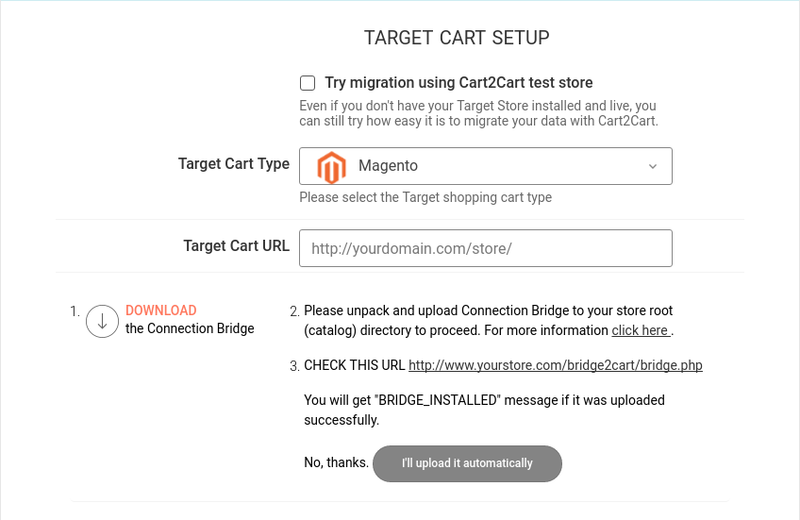 You’ll need to download Connection Bridge – an archive with Cart2Cart files that enable data transactions, unpack it and paste the files to your store’s root directory via FTP client. Also, there’s a possibility to enter your FTP credentials and have the Bridge uploaded automatically. That was the first, most puzzling stage of the migration procedure – the rest is a breeze. Next up – choosing entities. Simply put ticks near the entities you’d like to move, and choose additional options to enhance migration results. Some options are free and some are paid, see for yourself if you need them. Now you’re all set to start the Demo – you can move a limited number of entities to a new cart for free – it’ll take 30 minutes or less, and see how they look on your new shop. Afterwards, all that’s left is choosing a Migration Insurance plan (or not choosing it) and launching a full switch. Migration Insurance packages give you a chance to remigrate in case anything goes wrong after the transfer – like if your carts weren’t installed properly or some module on your new store causes a data conflict. Most likely that won’t happen, but Cart2Cart offers a few insurance plans, so people can feel absolutely safe. Cart2Cart is probably the oldest and most advanced migration service out there, so the range of entities they move is very comprehensive – in addition to products, customers, orders and items related to them, you’ll be able to move currencies, CMS pages, Coupon Codes, Taxes, Passwords, Custom Fields, your multistore, 301 SEO Redirects etc. 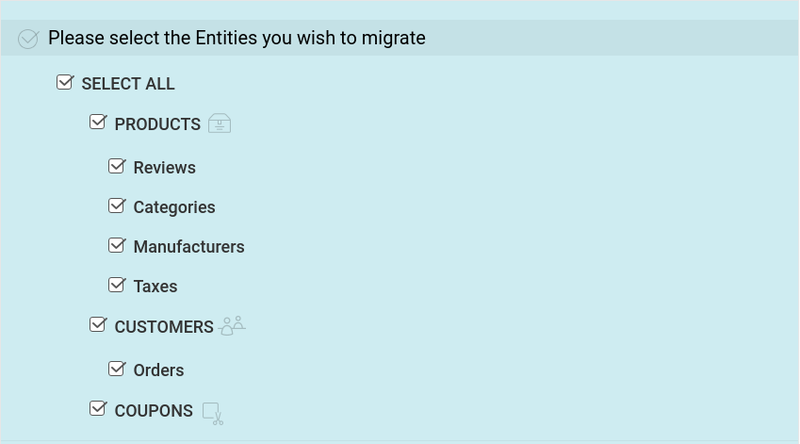 In case some new data occurs on your previous store after the transfer, you’ll be able to move it separately with Cart2Cart’s Recent Data Migration. The cost of this option is, as they put it, “50% of current full migration (based on amount of created data)”. 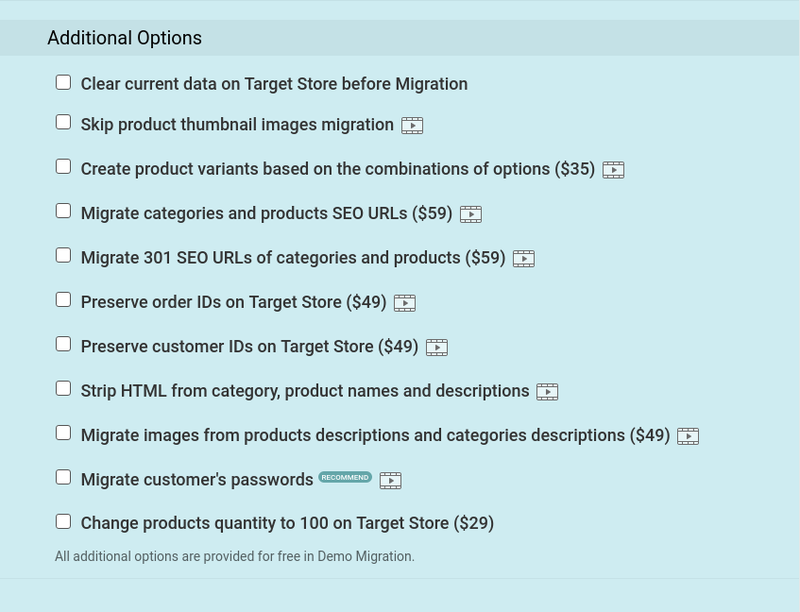 If you don’t even have time to click through Cart2Cart Migration Wizard – you don’t have to. 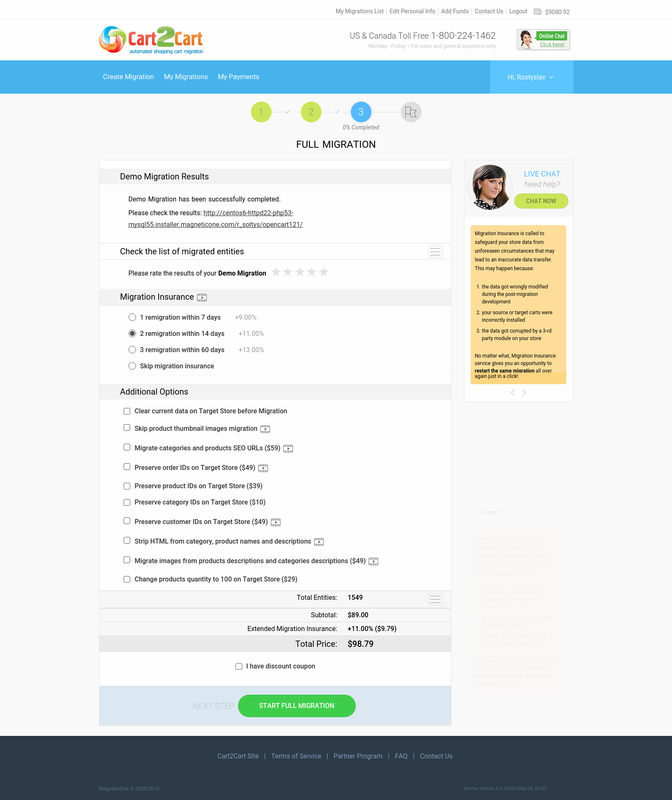 There are a number of Data Migration Service Packages available that allow to completely outsource the migration process to Cart2Cart’s technical engineers. It is a convenient, but more expensive option. If you’re running a small shop – ordering these packages probably isn’t so advantageous, unless you need data customizations. The service is aimed at store owners who want to save their time. 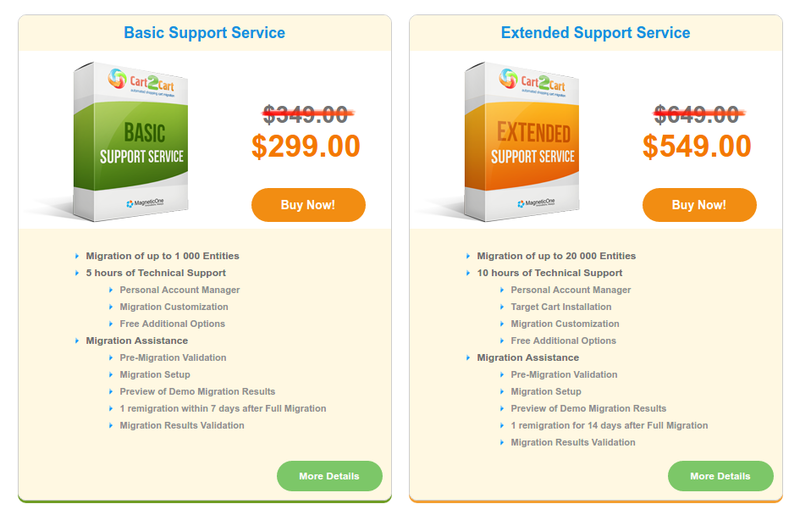 It offers tempting prices, great functionality and, a quick run for your migration. Although, if you’re transferring lots of entities it might take a little longer. 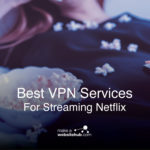 Keep in mind, that the service only transfers data. Afterwards, you’ll still have to set up the design template and install extensions so that your cart works properly. But as far as migrations go, Cart2Cart does a great job for a very reasonable price, so if you’ve decided to switch – by all means, use it, the service will substantially simplify this task for you.